The first thing that one notices when opening the box, is that the miniatures are of an excellent quality. The ships are 1/270 scale. That makes the X-wing just shy of two inches from engine to front tip. Made of plastic, the detail on them are amazing. The X-Wing is battle painted to give it that dirty “rebel scum” look that we all grew to love. Even the TIE Fighters are battle fatigue painted. The ships in the collection all look nice enough to store in a display cabinet if one were so inclined – I will write more about some of the other ships in my next review. Note that the miniatures are extremely fragile, so be careful with them (i.e. don’t hold the x-wing by the laser canons) – best to move them by the base. When first placing them on the pegs, note that the tip of the pegs are semi-circular, so that there is only one way to put the ships on the pegs. The first time I set up the ships, I didn’t know this, and I damaged one of the pegs (you can get replacements online cheap). The game box says that the game is designed for ages 14 and up, but I’ve played with kids younger, even my almost 9 year old daughter can play. There are tactics that are helpful, and children may have a tougher time with that aspect of the game, but they can still have fun blasting each other! Laser cannon firing sound effects are a requirement! John Williams soundtrack playing in the background is a plus! The mechanics of the game are rather simple. Each ship commits to a maneuver for that turn, then the ships move according to their pilot skill level. Each ship has a set of 2-dimensional maneuvers from which to choose, depending on the speed and agility of the ship. Each player must take those movement limitations into consideration when deciding tactics. After movement is resolved (including potential collisions), each ship attacks an enemy ship in range (there are three range categories) and resolves those attacks in order of Pilot skill level. Attack and defense are resolved with a number of 8-sided dice. Damage is incurred (including shield loss) and then the turn starts over. The pilot skill level and ship qualities may deteriorate as damage is taken. Despite coming with a 28 page rulebook, the base rules for the game are quite simple and fun to play. I don’t think that you need to get into the advanced rules to enjoy the game though they give it more depth for the more experienced players. It takes about 30 minutes to get the game set up (it should take less once the counters are punched out), and perhaps 15 minutes to go over the starter rules, and you can get a dog-fight between the 3 ships completed within another 30 minutes (faster for experienced players). The basic game is a 2 player game, but with more ships, more players can be included. I recommend playing with the main rules, as it includes the special abilities of the ships. These include, targeting locks, barrel roll maneuvers, focus, and evasions. I find that this is a nice balance of simplicity, and yet allowing for squadron (or wing man) tactics. More advance rules include special pilot abilities, secondary weapons, and droids. The special pilot abilities are also fun to play with, though I can do without the secondary weapon rules. There are also rules for larger battles, asteroids, and missions. The photo sequence below shows an example of play. The first photo is just after all three ships have resolved their moves (though the TIE Fighter in the rear has not conducted his barrel roll yet). The front TIE Fighter (already damaged) is having trouble losing Luke who has him “targeted”. The TIE takes an evasion option in case Luke hits him, he can evade one hit. The next photo shows the back TIE Fighter conducted his barrel roll in order to get Luke’s already damaged X-wing in his sights. As the superior pilot, Luke takes a shot first and eliminates the TIE Fighter he’s been targeting. Then Luke falls victim to the old “Thach Weave” trick and gets shot from behind to take another damage from an inferior ship and pilot. In World War II, this type of two on one maneuver was invented by US Navy F4F Wildcat pilot John S. Thach when the US pilots were desperately looking for tactics to even the odds against the superior Japanese Zero pilots and planes. It was first seen at the Battle of Midway. A pair of planes can get an advantage over a superior plane/pilot. The tactic soon became added to the bag of tricks for all WWII pilots. The base game sells for $39.99 retail, but you can find it quite a bit cheaper on Amazon, or other specialty markets like miniaturemarket.com or CoolStuffInc.com. Compared to the price of individual fighter ships ($10-$15 each), the value is excellent, since the game box comes with 3 ships. So you can actually get the game, plus rules, and everything else in the box, for less than the price of purchasing the three ships separately. The game is enjoyable as a 2 player game with just three ships, however I believe that it is more fun with just a few more ships and players. I do not believe that one needs to spend A LOT of money getting every ship in order to enjoy the game though. This is for you die-hard readers who want to read more background! Thanks for sticking with me. You will be rewarded two game reviews in one post! If you have seen the specials that come with the Star Wars trilogy, you might know that George Lucas was inspired by World War II aerial dogfights, and that the space battles he envisioned had its roots in that conflict and the movies he saw when he was younger. Similarly the X-Wing Miniatures Game seems to have its roots in a WW I aerial combat game called Wings of War. I don’t have the WW I game, but I do have some of the subsequent expansion for WW II planes, and I have the new WW II game that replaced Wings of War called Wings of Glory . The original Wings of War was a card game. The game developed into a miniature game (1/200 scale), but it can still be played with cards. In fact, each miniature still comes with a deck of cards, and really, the miniatures are mainly for visual aid and for aesthetics. 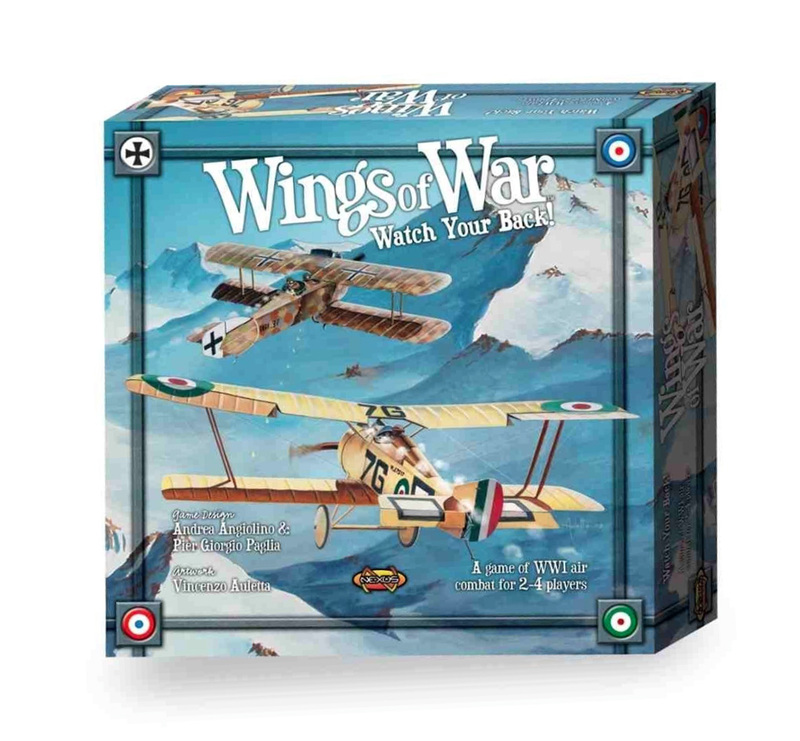 You can get this game either by itself (which includes rules, counters, boards) or with the gamebox plus four planes (at a discount). These planes may differ by distributor, but at one point they were packaged within the gamebox. This version seems to be out of stock, but you can purchase the small fighter planes for about $10-$15. 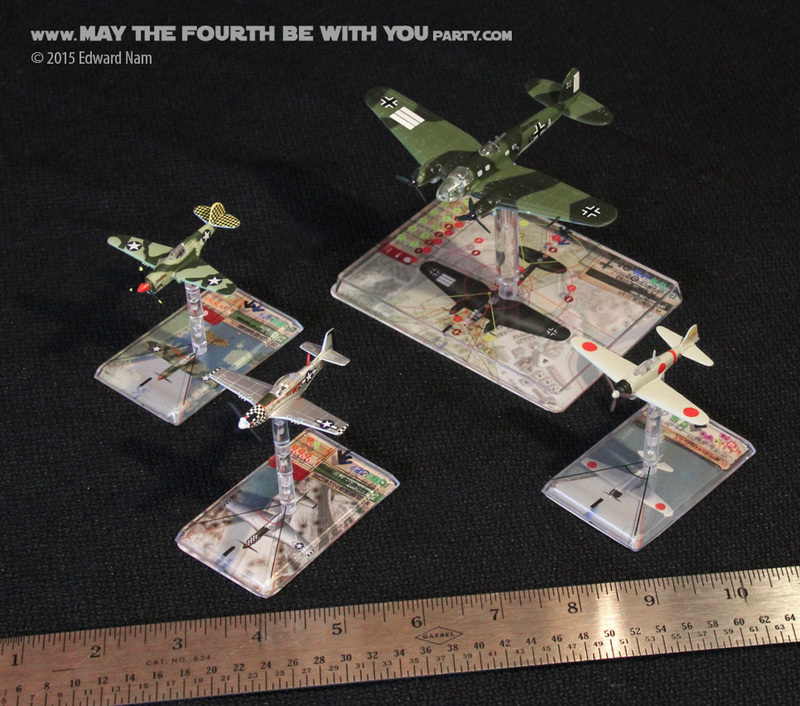 The Photo below includes a subset of the planes I own: the North American Aviation P-51 (silver Mustang), US Curtiss P-40 (camo Warhawk), Japanese Mitsubishi A6M2 (white Zero), and the large German Heinkel He-111 bomber. 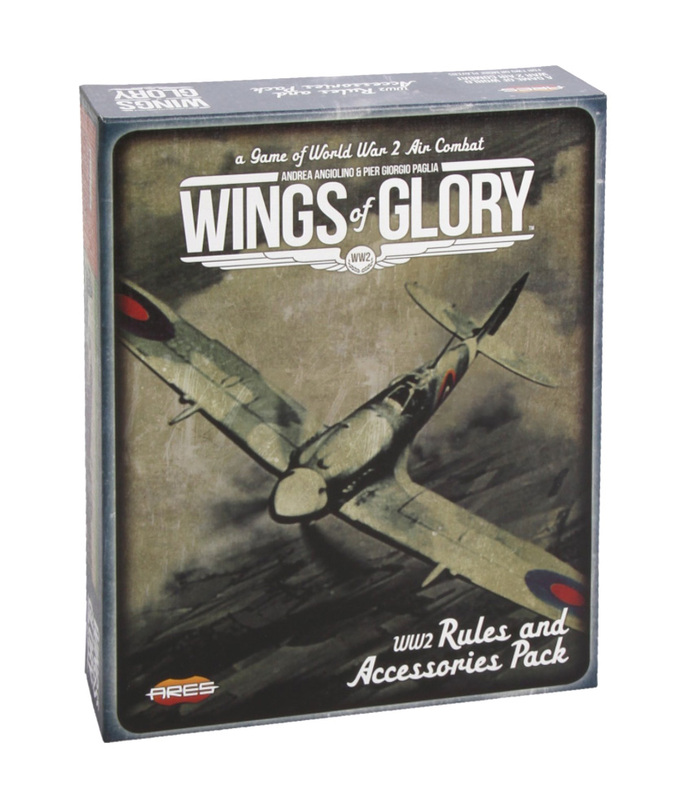 Though the rules for Wings of Glory are a bit more complicated (with gravity and inertia having an effect), overall, the principles of maneuver and fire are very similar. Below is a picture of two of the maneuver cards in Wings of Glory. Compare them to the maneuver template from X-Wing above. The advance rules allow for climbing, diving, and flying at four different altitudes (each peg indicating a different altitude level). The pegs and bases are not compatible with X-Wing. The WWII planes in Wings of Glory have some more maneuver options than the X-Wing ships do. The latter have 16 movement options on the maneuver dial, whereas the former has 18 cards for this particular P-40 (with many of the cards having 2 maneuvers on them: low speed and high speed). More advanced rules include tracking fuel, tailing, cloud cover, etc. The fire principles are simpler in X-Wing with attack and defense dice. In Wings of Glory, the weapon determines the number of damage counters, with damage counters having differing levels of damage on the back. The counter draw is the element of chance in combat. In more advanced rules, damage can occur to various parts of the plane (which can also occur in X-Wing – sort of). I’m not sure why they decided to use a stack of counters instead of dice and table (like most war-games). I’m worried that I’ll lose some counters, thus affecting the odds tables. I’m working on a random number generator program that will output results equivalent to the counter probabilities. I dislike having to regularly count hundreds of counters to make sure that the game is whole and the probabilities are correct). Overall, I believe compared to X-Wing, Wings of Glory is the more sophisticated game, where there are more opportunities to use tactics. Ironically, it is more 3-dimentional than X-Wing, but to make the latter a true 3-D space combat game would require a level of sophistication that would make it impracticable on a board game. These games are not substitutes for dogfight simulation video games. 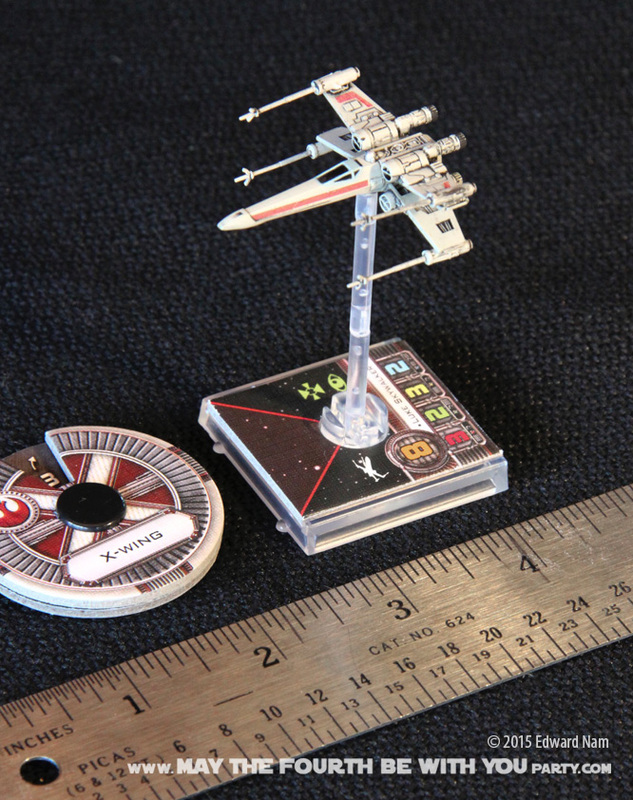 X-Wing arguably has higher quality miniatures, and if you’re a Star Wars fan, it just makes one really happy, just to gaze upon them! If you guys are interested in learning about tactics for either of these games, just let me know in the comments section, and I can write a post about this later. 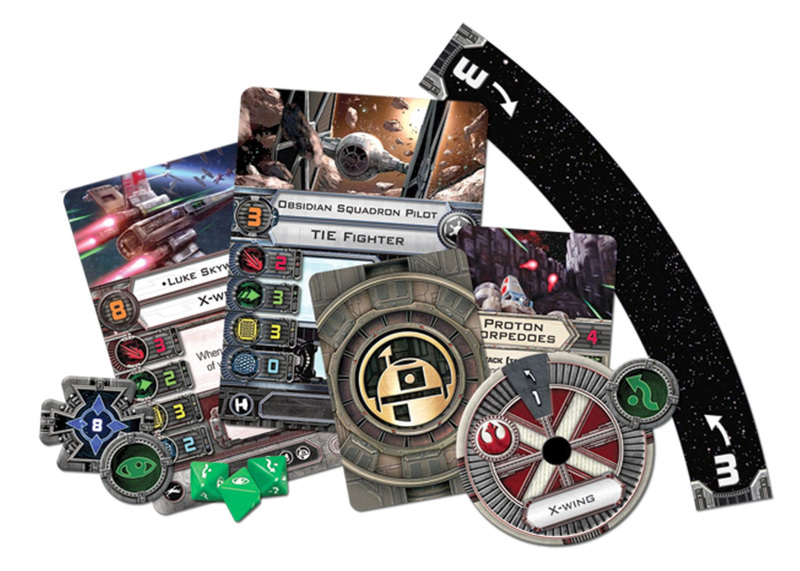 Checkout my other reviews, I show closeup pictures of more excellent X-Wing Miniatures (expansion packs) and a review of the new Force Awakens X-Wing expansion game.